7. After clicking “Share,” more sharing options will appear. 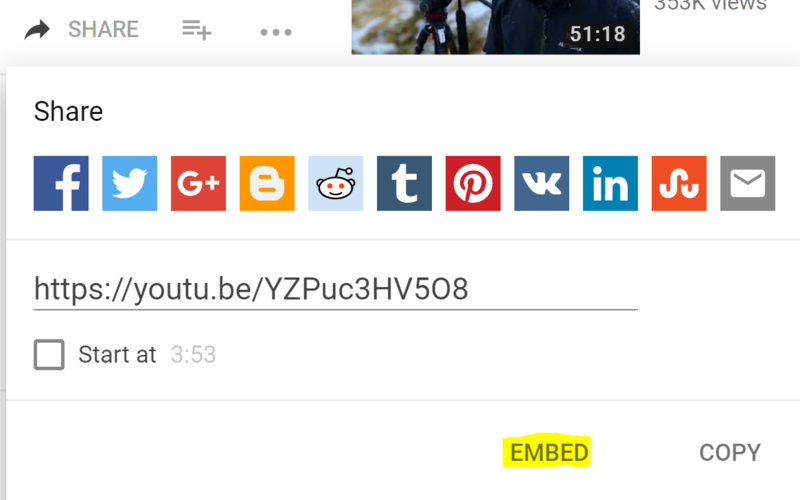 Select the “Embed” button. 8. Once the “Embed” button has been clicked, a new pop-up window will open. Adjust embed settings as you please and, when done, click the "Copy" button. 12. You may see a box containing the video you just uploaded or you may see a box with a red “IFRAME” in the center. If you see the "IFRAME" box, this is not how it will look on the frontend of your website, please continue with the steps. You can adjust the placement of the iframe (video) in the CKEditor and add text or pictures around it. 13. After you’ve added all necessary content, click “Save Changes” at the bottom of the CKEditor. 14. Go to the page you added the video to on the frontend of the website to test your video.